I was in Edinburgh on the day of the anti-Trump marches. Apart from disrupted bus services caused by the protests it seemed like a normal Saturday morning. I travelled from the outskirts of southern Edinburgh, to Comely Bank, in Edinburgh north. From there I went for lunch in St. Andrews Square in central Edinburgh. Normally, I would have caught a bus back to my home in the Scottish Borders but because of the anti-Trump march over North Bridge that route was closed. So I had to take a taxi to Edinburgh’s Commonwealth Pool, from where buses to the Borders departed during North Bridge’s closure. During that time, between 11 am and 1.00 pm when protesters were reportedly gathering, I saw four — repeat FOUR — anti-Trump protesters outside a specialist cheese shop in Stockbridge. I could tell they were part of the anti-Trump demonstration because they carried Scottish flags and wore T-shirts with anti-Trump slogans. Just like the people in this Evening Standard report, they were white, middle-aged and looked well-heeled too. I wasn’t on North Bridge so I can’t say how many finally gathered for the march. However, I had lunch in St Andrews Square, a few hundred metres from North Bridge and my taxi took me through adjoining streets and I saw nothing of the “thousands” of anti-Trump protesters who reportedly took part. On the evidence from my trip to the Scottish capital and photos of the protest, I would estimate that no more than a few hundred took part. In other words the media is inflating the number of protestors TENFOLD. I write that as an independent observer, not a “Trump supporter”, but what does that say about our news media? Ed. Thousands of people have protested on the streets of Edinburgh against Donald Trump’s visit to the UK as the US president played golf at his Turnberry resort, on the west coast of Scotland. Trump was seen playing golf with his son, Eric, on the Ailsa championship course. Earlier, the US president tweeted his golfing plans for the weekend. The US president said he had arrived in Scotland for “meetings and some golf”. Trump and his wife, Melania, arrived in Scotland on Air Force One on Friday evening, before travelling by motorcade to the Trump Turnberry resort in Ayrshire. By lunchtime, about 50 protesters had congregated by the police cordon on Turnberry beach. 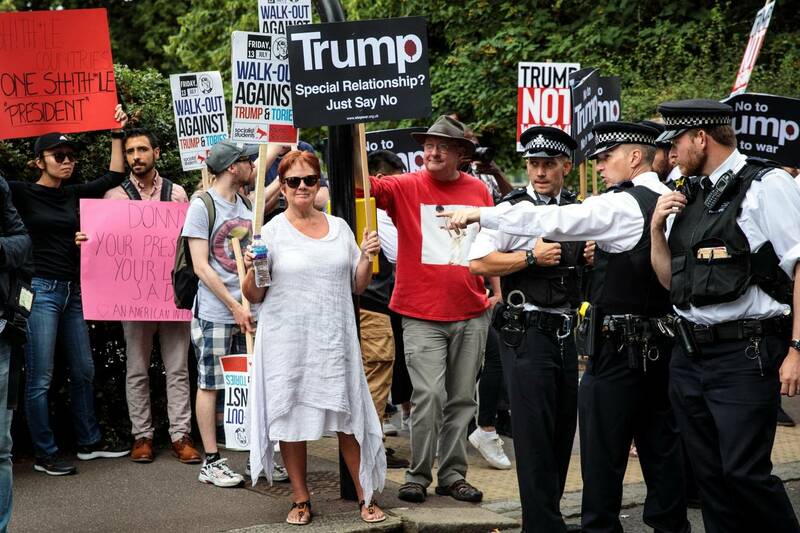 Just before 2 pm, the US president appeared on the golf course and waved at the gathering on the beach, to be met with booing and chants of “no Trump, no racist USA”. Meanwhile, close to 10,000 marchers were streaming through the streets of Edinburgh, ending up in Meadows Park to the south of the city centre, where families sat in the sunshine and enjoyed picnics, music and speeches from local activists.